Whether it’s the warmth of spring, the sunny skies of summer, the crisp autumn air, or the festivities of the holiday season, there is always fun to be had at Kings Dominion, one of Virginia’s premier amusement parks. With 12 thrilling coasters throughout the park, adventurers will be able to loop, flip, whirl, and drop to their heart’s content. Twisted Timbers is the newest addition to the Kings Dominion coaster family. A blend of wood and steel, this twisted coaster is perfect for the thrill-seekers in your group. The Dominator, Flight of Fear, and the Grizzly are other hair-raising adventures you’ll want to ride again and again. It’s not all white-knuckle rides though ― there’s fun for the whole family! Take a ride on the Dodgem bumper cars or spin on the Scrambler. Check out the view from the Eiffel Tower or visit the PEANUTS-themed area that your children will love. 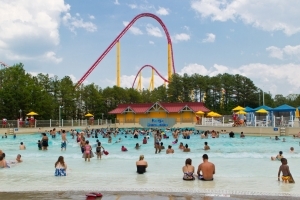 If you’re visiting during the warmer months, you’ll want to check out Soak City, the Kings Dominion water park. Thrilling water slides, gentle wave pools, and a lazy river combine to offer fun and relaxation all summer long. 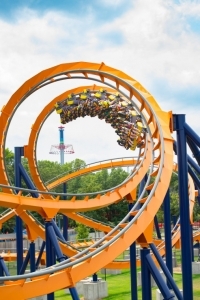 At aRes Travel, our Kings Dominion packages allow you to enjoy huge discounts on park entry and local accommodation for an affordable and convenient vacation package. When bundling tickets with a hotel, your package can include one of the many fantastic hotels in the area to meet your family’s needs and budget. Our travel agents can answer your questions and help you choose the package that is right for you. For exclusive Kings Dominion packages, including amazing savings on park entry, some of the lowest prices on hotels, and giant discounts on travel, call 1 (800) 434-7894 (international callers use +1 (619) 546-5622) to speak with an aRes Travel planning expert seven days a week, or book online now.